These are a chocolate-lover's dream! Dense and fudgy, just like a brownie, with the portability of a cookie! They're quick to make and are a great addition to any bake sale, party, or holiday cookie tray. Preheat the oven to 350 degrees F. Line two large baking sheets with parchment paper or a silicone baking mat. Put the chocolate and butter in a heatproof bowl and set it over a saucepan of barely simmering water, stirring occasionally, until completely melted and smooth. Set aside to cool to room temperature. In the meantime, whisk together the eggs, sugar, and vanilla extract in a medium bowl. Set aside. Add the melted chocolate mixture to the egg mixture and stir with a rubber spatula until completely combined. Add the flour mixture in three batches, folding it gently into the batter with a spatula. Once all of the flour is incorporated, stir in the chocolate chips. Scoop 1½ tablespoons of dough (or use a medium cookie scoop) onto prepared baking sheets. Bake for 10-12 minutes or until they are firm on the outside. Like brownies, do not over bake! Leave to cool completely on the baking sheets, then store in an airtight container at room temperature for up to 1 week. These can also be frozen for up to two months. 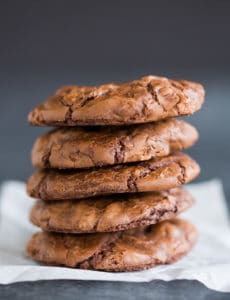 I use Ghiradelli 60% cacao chocolate for these cookies. It's not SUPER bittersweet, but I think you could use semisweet chocolate if you prefer.